This is my Grandma's 1956 United Big Ball Bowler game named Duck Pin Alley. I have only found one person who has ever seen this exact machine before. The other machine they saw was in "very rough shape" so I am guessing it's not operational. So this is the only working one of these specific machines we've been able to locate so far. The back story to this machine is that my grandparents purchased the machine from a local bar for my uncle, for his 8th grade graduation present. This was in 1962. My grandma seems to remember the bar making mention of something along the lines of the fact that "they don't manufacture this machine any more, so we are worried we won't be able to find parts for it if it breaks." So there were just two owners. It sat in the bar for a few years, and then it's been in my Grandma's basement ever since. So that's the reason why it's so well (overall) maintained! I've been trying to date this machine and we've settled on the year 1956 for the manufacture date. 1955 and earlier machines used a 30v power supply and this machine we believe uses 50v, the same as other similar type machines. Other similar machine, which we talk about next was also manufactured in 1956, so I would have to think this machine would be from that same year. 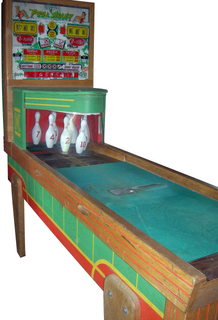 So with that said, I believe this machine is one of, if not the first big ball bowler machines that United ever made. While looking for more information on the machine I came across this machine online. In that particular machine you used a cue stick and pool balls, instead of bowling balls. This is a strange mesh of two games if you ask me, pool and bowling put together in the same game. I do not know which game came first. The Pool Alley game came out in 1956, so I would have to assume that the Duck Pin Alley game came out around the same time. The two games are remarkably similar. They seem to share the same pin hood, pins, wooden side of the lanes, and almost the same back glass artwork. The game mechanics appear to be a little different as Pool Alley has a Single/Double/Triple scoring feature and Duck Pin Alley has normal scoring and then also a "Beer Frame" feature (not sure exactly what that does yet). The scoring reels are sticking and aren't spinning properly. I hope to be able to clean these up so they spin properly. There are a few pins which immediately upon the start of a frame, the pins go up as if they have been knocked down. This may just be caused by a stuck lever or something else. I have not yet been able to diagnose it, but soon. The #1 pin is missing a piece, which causes the pin to swing freely when in the down position. This does not affect the gameplay, but I would like to fix it anyway. The #3 is cracked and has been super glued back together. It works for the time being, but if I can find a replacement, I will. I was told that the pin reset motor for these machines is rare and that I likely won't ever be able to find a replacement for it. So I was advised to pay close attention to this and to clean it up very good. So I need to take it apart and bore it out and make sure to get rid of any and all caked in grease that may be gunking it up. Then of course I do intend to clean up the machine as much as possible. A few collectors and enthusiasts have asked for more pictures and videos, so I thought I'd make a little web page to show it all. Also so that I have a venue to post pictures when I have questions as I go along restoring it. I also thought that some other casual onlookers might appreciate some pictures, at least the pictures of the outside of the machine. I know that very few people will be interested in seeing the detailed pictures of the inside of the machine, but they are here for those who are interested. 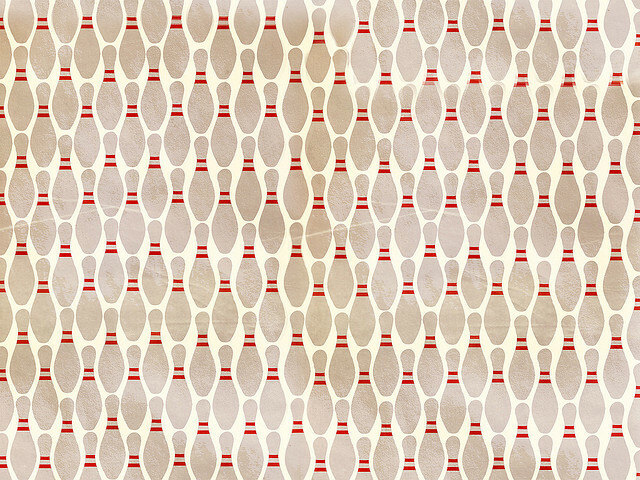 The bowling lane itself is about 117 inches or 9 feet 9 inches long. When measured from the back of the back box to the front of the machine, the machine is about 132 inches or 11 feet long. It is believed that the original size ball used on this machine was a 4 inch ball. More on that later. The pins used seem to be the standard United type pins used in a few other machines. The pins are about 8.5 inches tall. The distance from the top of the pin down to the hanging holes is approximately 1.25 inches down. The distance between the mounting holes is approximately 0.75 inches. I am listing these specific measurements because they are needed when speaking with others about finding replacement pins. This machine is numbered #352. I do not know if this game was mass produced, but you'd have to assume that United started the numbering scheme at 1. So there are at least over 352 of these machines which existing at some point in time. OK, onto the pictures. How I usually do things is that each picture is a smaller type thumbnail of the picture. This size picture makes them easier for most people to view in a browser. If you ever want more detail on a particular picture, you can click on it, and it will take you to the full resolution picture. The ball ramp return. A few people feel that the supports under the rails might not be original to the machine. They look more like a piece that might have come off a metal front door to your house. I would probably agree with this assessment. They do look a little out of place. I did not notice any disturbance in the artwork otherwise, so I don't think there was any other supports that they replaced. So either those are original (doubtful) or else there just simply weren't any supports originally. In either case, I guess I'm not too worried about it. The supports are there now, and they serve a prupose, so I intend to leave them in place. The first ball below is a trackball for an arcade machine. I used it in my testing because it is a 3 inch ball. Some people felt this was the likely size of the balls used in the machine. I have found that is not the case, as you will see in the video shown further below. The middle ball here is a replacement 4 inch ball that we found at some point. And lastly, on the far right is a 4.5 inch ball. I purchased 5 of these balls on my local Craig's list. A pretty lucky find. We should now have enough balls to last us forever. Here is a short video of the ball return system in action, along with me testing the various different ball sizes. - The first ball I use in the video is 4.5". As you can see in the video, the 4.5" ball works fine and returns well on the rail return system. - The second ball is the 4" size ball, which is what I believe to be the original ball size used. It works well and returns well on the rail return system. - The third ball I use in this video is a 3" ball. I did this to put to rest any question that this game used a 3 inch ball. As you can see in the video, the ball is too small, and when returning on the rail return system it actually hits some of the support beams which slows down the speed of the ball and as a result, the ball does not make it all of the way up to the top of the return rail. Now I did mention earlier that these supports might not be original from the manufacturer. So you could argue that even though the 3 inch ball didn't work, it might just be becuase of the after market rail supports. But I can tell you that they've been there since 1962 when my Grandma got the machine. And as I mentioned they've been using what I believe to be 4 inch original balls with the machine since then. So I really feel that 4 inch has to be the proper size ball, and the original size ball for this machine. For the more casual type viewers, this is your chance to escape. The pictures from this point on go more into the more details and technical pictures, which I imagine will not interest most people, only collectors and enthusiasts. If you'd like, you can click on THIS LINK to skip down to the "Completed!" section to see the final result! I was told, and I will include it here for completeness, that there are two different pin hanging gear assemblies used for these types of pins. The 1-6 pins use one kind, and the 7-10 pins use a different kind. You can see the United stamp on the pins here. Man, I did not realize how filthy this thing has become over the years until I looked at the back of the pins! Definitely going to be giving the machine a thorough cleaning! The machines label as #352. Elsewhere in the machine you can see that same number written on the inside of it, in marker, chalk and one other label like this one. Curiously, as you can see under this label is the number 253, which is the reverse of 352. Maybe just an accident? No where in the machine does it list any kind of manufacture date, but I did see this patent notice. I thought maybe some day it might be possible to see when these patents were obtained to help find the date. But that does seem pretty ambitious, and I know nothing about how to find that inforemation, so I will probably just stick with the 1956 assumed date for the time being. 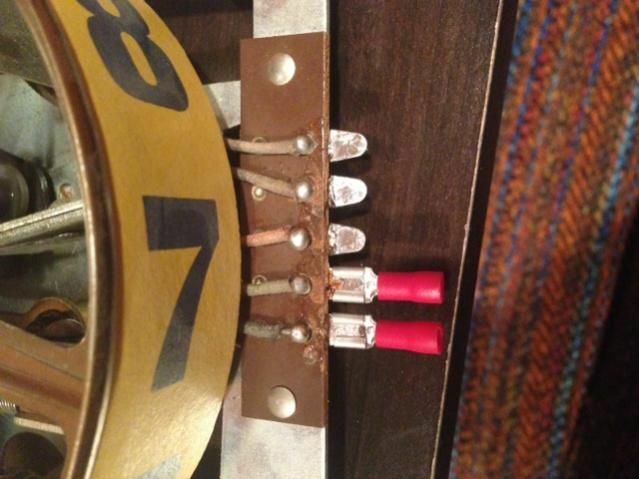 Here is a shot of the fuses. I was initially confused why there was a fuse missing. I was told that you either have to use the Normal Line OR the Low Line fuse, not both. If you put a fuse into both, it might not work at all. I was told that using the normal line just gave the motors and etc a little more "umph". So I will be keeping these fuses as they are today, with the Normal Line present and nothing in the Low Line. I've been working on a few things here and there, nothing I felt was update worthy until tonight. So now you're getting a few little updates all at once. I decided to give the tip a little more stability. To do so, I've been filling in the gaps in the kerf cuts with wood glue. Once I'm done with this, the tip should be a lot more solid. Next I decided to tackle the pin guard. Most hobbyists don't have one of these on their machine any more. But my grandma would prefer it be there because there are a LOT of great-grandkids who are inevitably going to crawl all over this thing. Below you can see the original. It's yellowed and its cracked in a few places. On the right you can even see that theres a screw holding a cracked part of it together. Here's a shot of the backview of the mold. You can see everything is screwed together holding it in place. It took quite a bit of tinkering to get it right but I was able to get it so the hood sat on my mold just right, as you can see below. Next it was time to cut my plexiglass to size. The sheet I got was pretty large, so it took a little doing. I carefully measured the length and the height of the guard, and cut the new piece of plexi to size. I initally tried to cut the plexi with a utility knife and then bend it to snap it, but that didn't work too well for me. I ended up cracking my piece of glass. Luckily, since the sheet was so big, I had enough for two guards. So I tried again, this time I used a router and a flush bit to cut through the plexi. This was infinitely easier. The plexi cut smoothly. Once the plexi was the right size, I also rounded the corners of the plexi so there wouldn't be sharp edges at the corners. As a bonus, the cracked plexi was still servicable, so I had a piece to use to test out my process first. First, I clamped one side to my mold. Note I left the plastic scratch cover that comes on the plexi there for all of this. I then used a heat gun. I made three or four passes with the heat gun and then I'd gently bend the plexi along the round of the paint cans. I just kept repeating that process. Three or four swipes, and a gentle bend, until it was bent all the way around. Once it made it's way all the way around, I clamped it into place on the right side as well. I gave the front a few more swipes with the heat gun at this point. These last passes with the heat gun are important, that way you know the plexi is really bent to shape, and it's not just the clamps holding it there. Once everything was set, I left everything all clamped up until the plexi cooled to the touch. That's when I knew it's new shape had set. Here you can see my test guard with it's plastic scratch guard off. You can tell it's the test one if you look really close. Theres a crack in the lower left of the glass. But crack aside, it looks perfect to me! Here you can see it matches up pretty close with the original. It's more straight, since the original has warped so much. So it passed my tests. Then I just rinsed, and repeated this whole process with my non-cracked piece of plexi to get my official replacement guard. What I did next was clamp it into place. You can see below it fits in there perfectly. The real reason I clamped it in place is because I wanted to drill the holes in it, for the screws that hold it in place. You can see the red dots for the holes below. No real secret to this part, I just used a drill bit to cut the holes out for me. And here's the shot of the old one last time, and the new one behind it. Note the new one still has it's peelable scratch protectant on it, so that's why it appears to have that matte finish to it. It will be crystal clear once I take it off. I plan on leaving this there until I actually intend to put everything back together. I've been toying with the idea to replace all the light bulbs on the machine with LED ones. There's two main benefits that would have came from doing this. First, they would be less likely to burn out. Second, and more importantly, they would put out less heat. This is important because heat chips the art on the backglass. So the lower the heat the better. I ordered several three different LEDs, all of which you can see on the right side below. On the far left is the original bulbs. As you can see, the light color is different on the LEDs, two of them are more white colored than the original, and the one is more yellow colored. Also, they appear to be not quite as bright as the original. I wouldn't have cared about the color difference if it made the back glass light up as well. The new bulbs are under the letters D, C, and I below. As you can see they don't light up very well at all, and in the case of the yellow LED, it actually makes a very distinct circle of light appear. So that settled it, LEDs are out. Oh well. I did replace all the light bulbs with brand new ones though. Some of the bulbs are probably 60+ years old at this point and from what I've heard, older light bulbs can tend to put out more heat. So that's why I still replaced all the light bulbs, even the working ones. Here you can see the little bow-tie piece is missing from the #1 pin. As I mentioned before, this piece is what locks the pin in place. Since it's missing, it causes the pin to swing freely when in the down position. It stops quickly, and doesn't affect gameplay, but still, it needs to be fixed so it locks in place like all the other pins. Here you can see the replacement piece that I got from Big Ball Bowler. The bowtie is there. Here you can see the two parts side by side. They match up except for the brown bar on the new piece. You can see that it's much larger than the original on the left. I figured that when it was installed, if it didn't touch anything, then no harm, no foul. Unfortunately, that was not the case. You can see below that this piece rests on the bulb holder next to it. I (foolishly) thought perhaps even this might be ok, because the brown tube appeared to be plastic. So I turned the machine on, and sure enough, sparks shot out and all the lights went out. Initially I was freaked out because I thought I ruined the whole machine! But it ended up just being a blown fuse. Once I got a new one, everything was cool. So lesson learned, if it doesn't fit right, don't be lazy, fix it. Here you can see I chopped off the excess part of the bar and it fits nicely! And lastly I just had to solder on the wire again as you can see below. After 57 years of use, these pins got a little grimey. Luckily it was mostly superficial and the pins themselves are really in incredibly good shape. But here are a few pictures of the pins before cleaning. Here is the back of the pins. Here you can REALLY see the dirt on there! I first just used some Dawn and warm water and I gave the pins a good cleaning. Next I used Novus Plastic Cleaner/Polish on each of the pins. Here they are all cleaned up! They look brand new (except for the broken #3pin)! This is MUCH better now as well! I also took the time to super glue a lot of those areas under the mounting holes towards the top of the pins. A few of them had cracked, so I thought they could use a little reinforcement, so I glued each of them. Got a few updates I thought I'd share. A few obstacles cleared, with a few more to go! This is the part inside of the pin hood which resets all the pins at the start of a frame. I was told that this was the one piece that I probably would not find a replacement for, and that I needed to be very careful with it. My cousin Dan and I took apart the pin reset motor and cleaned out all the old caked on grease. Then we used the 3-in-1 oil to lube it up. I don't have any pictures of the actual clean up but the assembly seemed to glide more much cleanly afterwards than before. I also used this 6 pin connector assembly for all the cords. So now I can easily remove the motor from the machine just by unplugging this one connector if needed. There were two main parts that we cleaned once we took it apart. There was this assembly here that was caked on with grease. You can see below it's nice and clean. Here you can see the four main areas that we cleaned out for the grease. You can still see some of the grease in the picture below. Once all cleaned up we lubed up any area that had metal to metal contact. If it was some kind of plastic and metal that were touching, we did not lube those up. Each reel has either 3 or 5 solder connectors on them. I took these score reels home for cleaning, to do that I had to cut the wires off of these. Then once home I used a soldering iron and a de-soldering pump to remove all the solder on each of these connections. I decided to use quick disconnects (shown below) instead of solder to re-attach these back in the machine. I'm not that great at soldering, and I figured it would be nice to be able to remove a score reel easily if I ever needed to. Some people on the forums are skeptical of this solution. They are worried that these disconnects might shake and eventually fall off. However, I found the right size connector that fits all the way over the solder point as you can see below. If done correctly, they fit on there very snugly. So I think we'll be ok. But nonetheless, it's something I will have to keep an eye on. If issues arise with the connectors falling off, then I will have to solder the wires on there. Then if I really wanted to, I could use those 6 pin connector assemblies like I did with the pin reset motor. I will just place the connectors a little far away from the score reels so they don't shake as much. But we'll play that by ear, I'm pretty confident that these quick disconnects will work just fine. - Cleaning the stepper units. - Using a wire brush to clean all the connectors inside of the machine. - Giving the bottom box a good vaccuuming. Time for my final update! But first, there's been some interesting discussion about this machine on the forum lately. Someone pointed out that the artwork on the machine appears to have been altered. They said that the "Duck Pin" text does not match up with the rest of the artwork. And I'm inclined to agree with that. If you check out the picture below you can see that the Duck Pin text is a very different style than the work Alley next to it. It looks like someone hand painted those words on there. Not to mention that the red and yellow colors appear to be different looking...more on that in a minute. If you remember what I mentioned before, this machine appears to be clearly related to this Pool Alley machine. 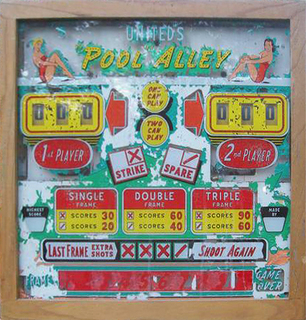 The artwork actually appears to match up entirely with the exception of the title and the "Double" and "Triple" blocks which have been replaced with a ball and pin and a "Beer Frame". Here you can see the two other blocks which have possibly been scraped off the "Pool Alley" machine linked above, and repainted with something else. My own personal belief is that this modifcation was not done by some individual, but was done by United themselves. Perhaps they had a lot of the Pool Alley parts lying around and decided to reuse them for this. Also, although the color of the yellow and red above appear to be slightly different than the rest of the artwork, but when the artwork is lit up, it matches perfectly. There is just a silver coating on the back of the glass that gives it a darker appearance in the rest of the artwork. For the modified art parts, they used a different back coating, other than silver. So it looks different with the lights off, but with the lights on you can clearly tell it is the exact colors used elsewhere. So they did use the exact same paint. I have no way of proving whether or not the United company did this themselves, but I am pretty sure they did. My grandparents bought it in 1962. We suspect it was built in 1956. So I can't possibly fathom why a single person would hack up a new machine within it's first 6 years of life to make something different. Especially since it was just a bar that owned this machine before my grandparents. And they just had it in the bar, it's not like they were some hobbyist/collector. I have not been able to find anyone else who has this machine. Only two people out of probably hundreds who have seen this machine now, have said they have even seen such a machine before. Neither of those people have any pictures or know the actual owner of the machine they saw. So while I can't say that this machine is one of a kind for certain, it certainly does seem to be at least very rare. That doesn't mean this machine is worth a million dollars or anything, but it just makes it a little more interesting is all. As they say on Pawn Stars, just because it's one of a kind, doesn't necessarily mean it's worth a lot of money. But I like it, it just adds a little intrigue to the game's history. Anyway, onto the restoration photos! I'm told that my pins are more the size you typically see on a shuffle machine and not a ball bowler machine. Well, I sent the big #3 back to Mickey and he was able to locate this beautiful blank pin for me that was the correct size. So thanks again Mickey! But since there's no number on it, and my existing #3 pin was working fine with the super glue, I decided just to hang onto this pin as a backup, in case one of the other pins ever breaks. It's actually sort of nice that it doesn't have a number on it. It will make it easier to use for any of the other pins in the future if needed. Again a special thanks to my cousin Dan for these next few parts. He was a huge help and I was happy to have him around. For the next part we took apart the stepper units on the machine. On the one on the right you can see we have all the parts removed for cleaning. The one of the left is still assembled. Just to give you an idea of how many little parts go into these things. We cleaned off all the parts of all the caked on grease from 1956 that no doubt was causing some issues. We put a small amount of contact grease back in the few areas where there are metal to metal contact. The next item Dan and I tackled was the piece of wood behind the pin hood. Not sure how exactly but after all these years, this particular piece of wood was twisted and beat up as you can see below. The balls roll flat down the lane, so I'm not sure how they would have ever hit this piece of wood. But nonetheless it happened, so we decided to replace it. Next I put in the new plexiglass guard that I made and screwed it in place. It fit great and getting rid of that old yellowed one made the machine look so much better. You'll see more pictures of this in the completed pictures at the end. And in this picture you can kind of get an idea of just how complicated each one of these relays is. There is a series of switches for each one. If you have one little switch bent wrong, it can break 5 different things and cause the pins not to function right. Unforunately this game did not come with a schematic for these, so I was kind of on my own to figure them out. When I started this, there were several issues with pins not triggering correctly. And there was an issue where some of the pins would get triggered at the start of every frame, even without having thrown a ball yet. So there were some serious issues here. After maybe 10 hours hunched over this machine, playing with each one of these individual switches, I believe I now have it working pretty danged well! So I'm happy to call this game completed! So here are some pictures of the machine now that it's completed! The main difference is really in how the game functions because it works and scores correctly now! But there are definitely some improvements in the appearance of the pins now that I've polished the pins and gotten rid of the yellowed pin guard. Just another picture for good measure. I just liked the perspective of this photo. Some of these bulbs were burned out when I started to work on the machine and having them all lit combined with all the other clean parts just makes the pins look awesome. I thought I would just put a few links of all the various pieces of information I've found to be useful for this project, just in case it's helpful to anyone else. This site has a listing of (almost) all the known arcade games out there. This machine isn't on there yet, but I will be adding it at some point! The Pool Alley machine information is found on this site however. Also, the forum on this site has a great and active community. So far there have been several people who were more than willing to help. Mickey from this site has been amazing so far. I am hopeful that he will be able to find me the few replacement parts that I may need for this project. It's always great to talk to someone who just appreciates the hobby so much! I also found these great videos on his YouTube channel about how to repair these types of machines! Chris from this company didn't have any parts for me, however he was very helpful in getting me lots of information he knew about the machine. I did speak with Doc Doom from this site. He was very helpful. He's the only other person who had seen this machine before, though the other machine is in rough shape he said. He may have some replacement parts for me as well when I get to that part. This website is a wealth of information. You can check out this page specifically here for a detailed history on bowling machine. I actually gave the people from this website the link to mine, and they've now included pictures of this machine on their history page. Here is the link to their page about it, which just has my pictures. This page talks about how to clean and repair all sorts of Electro-Mechanical (EM) machines, including bowling machines. It's going to be VERY helpful once I start to actually get to the repair work on this thing! This page talks about a DVD that is available for sale regarding repairing ball bowler machines. I ordered it and it's on the way! This site does have some parts for bowlers but not for this one. I also reached out to them and they did not have any manuals or schematics for this machine either. Still I thought I would include a link to their site since other people with ball bowler machines may find them useful. - Here is the "main" forum thread where I've been posting most of my updates and questions. - Here is my other thread which is just dealing with finding LED replacement bulbs for the lights.